DEFENDING CHAMPION CHRIS Froome almost crashed out of the Tour de France — after being knocked off his bike when an overzealous policeman mistook him for a fan on stage 17 on Wednesday. Team Sky leader Froome, a four-time champion, finished the stage in eighth place at one minute and 35 seconds behind Colombian winner Nairo Quintana and 48 seconds behind teammate and overall leader Geraint Thomas. 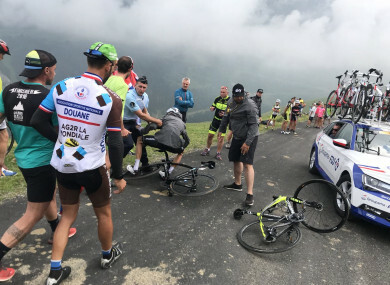 He tried to get Froome to stop and, amid the confusion, the six-time Grand Tour champion crashed. Froome avoided injury and is set to start stage 18 on Thursday. “It was a misunderstanding. Chris is fine,” said a Team Sky spokesman. Froome, who had been aiming for a fourth consecutive Grand Tour victory after triumphing at the Vuelta a Espana last year and this year’s Giro d’Italia, is now in a battle for a podium place. Team boss Dave Brailsford said they will now plan to make sure Froome joins Thomas on the Tour de France podium: “He’s not out of it necessarily, there’s a big mountain day to come, and the time trial. Email “Froome knocked off his bike by French policeman who mistakes him for fan”. Feedback on “Froome knocked off his bike by French policeman who mistakes him for fan”.